i am completely new to this program and this is what i was looking for, so a big thanks for making it. 1. Trailer sometimes downloads sometimes not, i have noticed that i don't have a stable INTERNET connection and it sometimes disconnects, so TMM is unable to resume downloads i think and i can see .part file in the folder. I tried to select download trailer again but it wont download then. EDIT: i deleted .part file and downloaded trailer again and it worked. But i think it must resume download itself. 2. Is there any way to rename trailer as Trailer.MovieTitle.Extension for example; Trailer.Act.Of.Valor.2012.mp4? 3. Is it possible TMM create a new folder (may be named as Media or whatever) in each Movie folder and put all info like posters,images and everything it scrapes there. This way it would look much organized and less mess. 4. It doesn't show progress when downloading Trailers, so i cant see what its doing in the background and how much download is left. 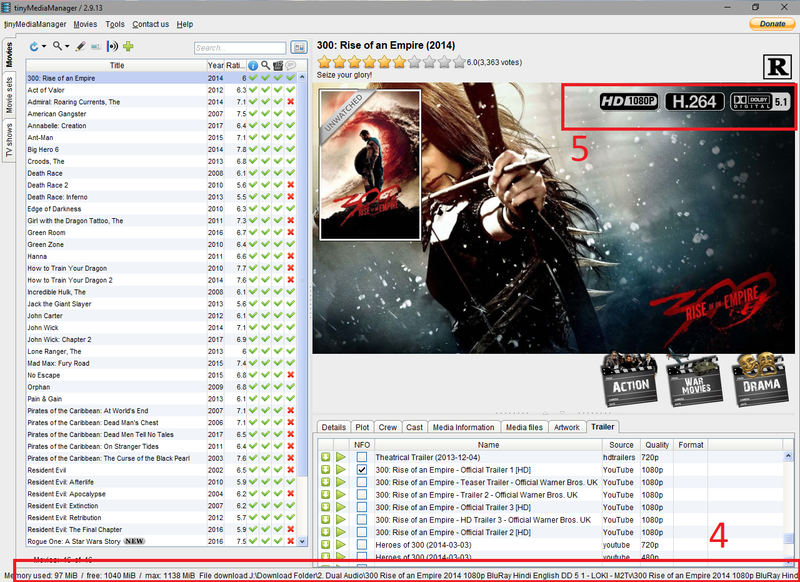 Although it shows movie name whose Trailer is being downloaded which isn't enough. EDIT: I just noticed that if the movie's name is too long, then there is no any space left for progress bar to appear at below right side, but i think its still there. So please fix it to shorten the Movie's title so that progress bar remains there always. 5. Is it possible to show Dual Audio info? for example; i have some movies dubbed in HINDI, therefore each movie has two Audios English and Hindi, so i want to see if both Audios are 5.1 channels or 2.0 channels and it also display both languages in the Main info panel. Currently it only display Default Audio info. 1. this is really not our focus (tmm is a media manager and no download manager! ), but I hope I can find a solution here..
2. no - as in the Kodi wiki (and this is how we implement it), the -trailer postfix indicates a trailer! (2018-11-02, 08:25)mlaggner Wrote: 1. this is really not our focus (tmm is a media manager and no download manager! ), but I hope I can find a solution here..
1. My main reason for downloading TMM was to download Trailers automatically for already downloaded movies, and you have this feature in your program, so why not improve it? i have seen many users complaining about this feature and i hope this will make your TMM a complete Media Manager. So please look into it and improve it. 5. Yes it does show the info there, but i want it to show on main info panel, where movie poster is shown. I am attaching a screenshot for reference and name it according to my question numbers to help you understand what i am talking about. thats good news, thanks for fixing it up. and kindly fix trailer download too..its too important for me.